Welcome to August's Diva Dare! Jen here with my take on this month's dare entitled Celebrate Good Times. Verve is turning 7 this month and we’d love to see your celebration cards. Think wedding, birthday, anniversary… anything that brings the confetti out! Today I'm sharing a clean and simple birthday card I made for a friend of my daughter. She LOVES bright fun colors so I went with white, lime green and bright pink. I started with a white A2 card base and then layered it with another white piece of card stock embossed with dots. I used a scalloped border punch to create the three little scallops and added three sequins to the top. 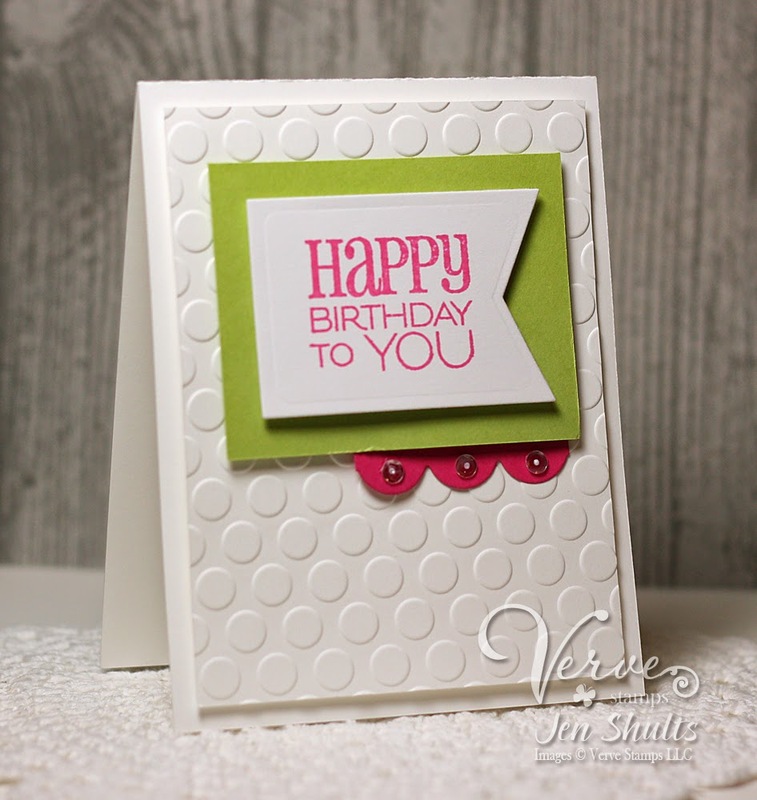 I stamped Birthday To You Plain Jane on top in bright pink and die cut it with a large die from the Banner Bundle Die Set. Hope you enjoyed my take on the Diva Dare this month! Now you are invited to play along with us and get inky! Two ways to win prizes for double the fun! Win a $40 gift voucher to Verve! Take our Celebrate Good Times dare and link your card up to be eligible to win. Entries must have a celebration theme: birthday, wedding, anniversary, confirmation, new job, retirement, new baby, new home - anything you can celebrate, be posted 8/8 or later, include at least one Verve product and be linked up to the linky widget by 8pm Mountain on 8/23/14. One participant will be randomly selected to win the gift voucher. You can enter as many times as you like, but each card needs to be in a separate post. Win a Verve set of your choice! For another chance to win some new Verve, leave a little comment love on our design team's Celebrate Good Times Diva Dare posts! One lucky commenter will win a Verve stamp set of his or her choice, so be sure to tune in each day! Comment deadline to be entered in our prize drawing is August 23, 2014. Winners will be announced on August 24, 2014. Go forth and get inky...we dare you!